Silica, Natural and Artificial Flavoring, Calcium Silicate, Sucralose. Disodium Phosphate, Sucralose, Acesulfame-K, Maltodextrin, Silica. Assess your tolerance by taking 1/2 scoop prior to training. Once your tolerance is assessed mix (1) scoop with 4-6 ounces of water 30 minutes pior to training. Do not exceed (2) scoops in a 24-hour period. Declare War on the Weights! 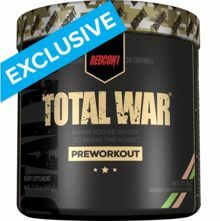 RedCon1's amazing pre workout supplement will take your training to the next level, and there's more amazing flavors than you can count! 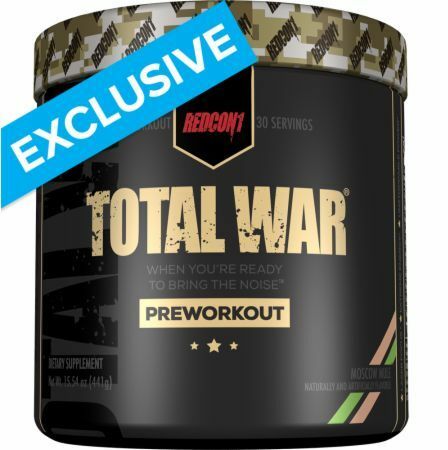 Read our blog post about the Total War Pre Workout for the most in-depth description! Listen to the legendary Tim Muriello talking about Total War's ingredients on our channel! Our Total War Tasting Panel! What flavor was best for CJ and Robert? Take a look! Fireball This is a Buy 1 Get 1 FREE offer! Blue Coconut This is a Buy 1 Get 1 FREE offer! Kiwi Lime This is a Buy 1 Get 1 FREE offer! Moscow Mule This is a Buy 1 Get 1 FREE offer! Orange Crush This is a Buy 1 Get 1 FREE offer! Pineapple Juice This is a Buy 1 Get 1 FREE offer! Rock Candy This is a Buy 1 Get 1 FREE offer! Tiger's Blood This is a Buy 1 Get 1 FREE offer!